Concussions can happen anywhere. From a fall on the playground to a hard hit on the field, accidents that result in a concussion are especially common in children. For parents, the most important thing you can do is not underestimate just how serious they can be. Recognizing the symptoms and knowing the right steps to take are crucial to ensuring your child receives the proper care. John Leddy, MD, FACSM, FACP, a Professor of Clinical Orthopedics and Rehabilitation Sciences and Director of the University at Buffalo Concussion Management Clinic, explains the common symptoms of concussion, how to treat youth concussion properly and ensure your child returns to school and sports safely. 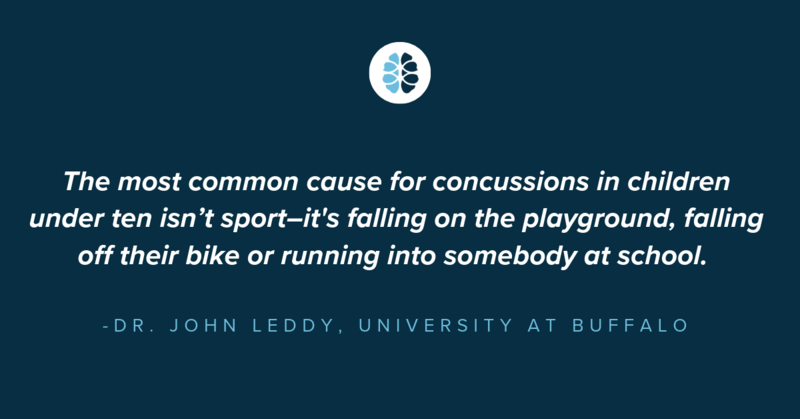 “A concussion is a temporary disturbance of brain function that occurs when traumatic forces are transmitted to the head, either directly or indirectly,” explains Dr. Leddy. This means that a concussion can occur from forces other than a direct blow to the head. A hit to the body can jostle the brain, causing it to collide with the skull and result in a concussion. But what makes concussions so scary for parents is that they aren’t always visible. What are the common symptoms of concussion? Concussion results in the fairly rapid onset of a series of symptoms such as headache, dizziness, blurred vision, trouble with concentration, memory or balance. “A concussion typically evolves over a period of 24 hours or so, and it may continue to evolve or be persistent, depending on how bad the injury is,” Dr. Leddy states. My child is under 10, how can I tell if they have a concussion? Keep an eye out for any changes in behavior. “Anything out of the ordinary, such as being less active, more tired or more irritable, is important to note,” says Dr. Leddy. Think about a possible cause of injury. If you notice something’s off and know they were playing earlier, ask the child, “Hey, did you hit your head?” or “Did you fall down and bump your head, or did you get kicked in the head?” It’s important for parents to start the conversation since young children might not know what to say. “The first step is to make sure that the injury is not something more serious,” says Dr. Leddy. “If your child is saying, “My headache is really bad,” he or she is vomiting or isn’t answering questions appropriately, it may be a brain injury that is more severe than concussion and you need to take your child to the emergency room.” These symptoms could be the sign of something more severe such as bleeding in the brain. 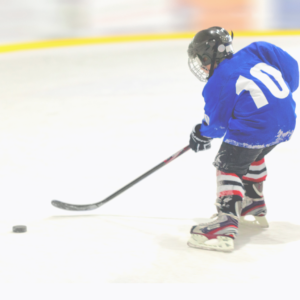 How long should my child sit out of sports and school? Is screen time OK when a child is recovering from a concussion? Once symptoms have stabilized or started to improve after the first few days, you can start to reintroduce activities to your child’s routine. “They can text their friends and have minimal screen time,” Dr. Leddy says, “but they shouldn’t be looking at a screen for an hour.” Kids should do things in small chunks of time, 10 or 15 minutes each, and take scheduled breaks. “I like the ‘15-5 rule’ for the first days after concussion: do cognitive activity for 15 minutes, or stop sooner if symptoms increase, and then take a 5 minute break. Keep repeating this cycle until you complete your task”. How can I manage my child’s pain at home? Do helmets help prevent concussion? How common are concussions in kids? It’s estimated that over half of student-athletes will sustain at least one concussion before they graduate high school. “The most dangerous thing an athlete can do is to continue to play with concussion symptoms or return to the playing field too soon, which puts them at increased risk of additional damage to the brain,” says Dr. Leddy. Educating children, coaches and parents about the signs and symptoms of a concussion is vital to ensure they are treated properly before returning to play. For more breaking news and resources in the field of concussion, make sure to follow Concussion.Org on social media.